Was your loved one a victim of elder abuse or nursing home neglect? Before you hire a lawyer, consider this. Nursing home litigation is one of the most complex areas of law. Any law firm that takes a nursing home neglect case must know a maze of Massachusetts and federal nursing home care laws and regulations. They have to know all the evidentiary issues backwards and forwards and need an in-depth understanding of medical and health related issues along with working relationships with competent medical experts. Health care liability claims also require an understanding of the nursing home budgetary process, medical technology, medical billing, nutrition and geriatrics. Most patients in nursing homes are also dealing with multiple medical issues. Medical treatment is continuous and usually involves multiple medical providers and specialists, which creates mountains of medical records that contain complex medical concepts and terminology. Nursing home medical records are more detailed than other types of medical records and going through all these medical records is time consuming. An attorney cannot just dabble in nursing home abuse and neglect law. Up until about the 1930’s, families were the ones that cared for the elderly members of their family and charitable hospitals would care for people without resources or family. However, the nursing home industry expanded dramatically in the second half of the 1900’s as concerns over the quality of care led the government to enact laws and programs to offer better resources and services for the elderly starting with the Hill-Burton Hospital Construction Act, then the Medicare/Medicaid Act, and the Social Security Act Amendments of 1972 (incorporated standards for nursing facilities). All this led to the passage of the Omnibus Budget Reconciliation Act of 1987 (OBRA). OBRA fundamentally changed the way Nursing Homes were regulated by incorporating a framework for government oversight. It also provided guidelines nursing home facilities needed to implement and follow in order to receive payments from Medicare and Medicaid. All these laws led to the proliferation of large private for-profit nursing home chains. These large chains, some of which are back by hedge funds and private equity firms, owned and operated over 65% of all the nursing facilities in the United States as of 2003. Nursing homes are big business in the United States. The problem is that bottom dollar thinking can lead to a decrease in quality of care. This in turn has led to an increase in cases of nursing home abuse and neglect. 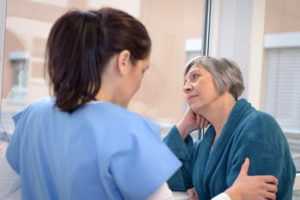 The problem of nursing home abuse and neglect is likely to increase in the future as the baby boomer generation ages and comes to rely more and more on nursing home facilities. According to a 2004 report prepared by the United States Census Bureau the number of people ages 65 years and older will increase from 35 million in 2000 and 40 million in 2010 to over 53 million by 2020 and 70 million by 2030. By 2030 people 65 years and older will make up 20% of the population in the United States. Everyday in the United States some 10,000 people celebrate their 65th birthday. As the population of people over 65 years of age increases so to does the demand for skilled nursing facilities. A 2016 Congressional investigative report determined that 30% of the nations 17,000 nursing homes were cited for approximately 9,000 instances of elder abuse from 1999 to 2001. It is hard to imagine that 1 out of 3 nursing home facilities reported abuse. However, this report only dealt with REPORTED cases of elder abuse. Underreporting is a major problem however. 40% nursing-home staff admitted to psychologically abusing patients. Did your loved one suffer harm or death as a result of elder abuse or nursing home neglect? Fight back! Our lawyers can help you hold negligent or abusive caregivers accountable for their actions. It is important to work with a personal injury attorney to investigate the circumstances surrounding your loved one’s accident or wrongful death in order to determine if the nursing home has any liability. To learn more about legal actions in cases involving nursing home neglect or abuse, contact our law offices today for a FREE legal consultation, where you can find out more information about whether or not the nursing home facility might be liable for compensation. Our experienced team of personal injury lawyers can help evaluate the circumstances of an injury to help you determine if compensation might be available to you.